Internet protocol (IP) closed circuit television (CCTV) technology has been around for more than ten years, but has only recently become the preferred choice over traditional, analogue based systems. This is partly due to IP’s initial cost falling in recent years, which has made it a realistic, affordable alternative to SMEs that may lack the financial resources of larger firms. However IP CCTV systems, which send and receive data through a network video recorder (NVR) via WIFI or the cloud, have a wide range of other benefits. These make them inherently more flexible than analogue-based systems, which store footage locally using a digital video recorder (DVR). Below we’ve compiled our top ten business reasons to switch to IP, if you haven’t already! Low definition analogue-based CCTV systems, often installed in companies many years ago, are beginning to reach the end of their service lives. Keeping them running past this point will cost more in maintenance in the long run than a complete system upgrade or replacement. If your analogue system is old, malfunctioning or unreliable now is a good time to look at your options. 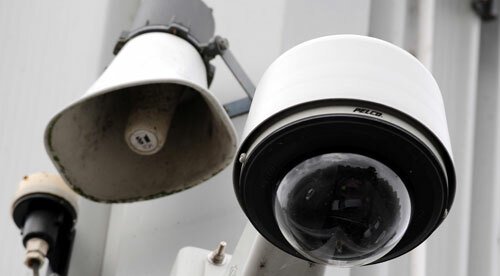 CCTV systems record a lot of footage, but who is going to monitor it? Often companies only check CCTV footage retrospectively, to try and solve a crime that has already happened. Wouldn’t it be better to monitor CCTV footage constantly and, for example, stop would-be thieves in their tracks before they make off with your gear? You could pay someone to watch your company’s CCTV streams 24-7 but this is very expensive. A far better and more cost effective solution is video analytics. This comprises sophisticated software, which connects to your IP CCTV system and detects anything from motion and missing objects to tampering with a security camera. If the software detects an intruder it immediately triggers an alarm, which you can receive on your smartphone or tablet. You can then check the live CCTV footage streamed directly from site (providing you have access to a WIFI network or a decent mobile data signal) and take further action as required (e.g. call emergency services). Video analytics software logs anomalies and creates ‘events’. You can see exactly when these took place and view them immediately instead of poring over hours of footage. You can set your own parameters too (e.g. trigger motion detector alarms only outside of office opening hours). If you like the idea of video analytics, it is also possible to link your IP CCTV system to a professional remote monitoring provider. These operate round the clock from secure observation centres and, when an alarm is triggered from your site, shoulder the responsibility of checking CCTV footage and taking further action if required. Using a remote monitoring provider offers peace of mind and is suitable for businesses that want a 24 / 7 managed security solution. IP was once more complicated to install than analogue-based technology but not any more. Ease of installation is a primary feature of virtually all IP CCTV systems and manufacturers promote features such as universal plug-and-play camera recognition to get you up and running in the shortest time possible. IP CCTV systems are almost infinitely scalable. You can scale from a single camera up to thousands if you need to quick and easily. With IP you can add cameras one at a time, whereas analogue systems can often only grow in steps of four or 16 at a time. In terms of flexibility, IP systems can share a wired or wireless network with other products or applications that send video, audio, PTZ (pan-tilt-zoom), binary or power commands. They can also grow with your existing IT system, utilising tools for automatic system maintenance or network management for example. If you already have an analogue CCTV system in place, a new IP system can use a lot of the same infrastructure (e.g. cabling) to keep the initial cost down. As the old analogue infrastructure components begin to fail, you can replace them with IP components. An analogue DVR may be cheaper than an NVR, but think long term. An NVR doesn’t just manage video surveillance, it can look after your storage and data management needs too. By using IP, you can also avoid the costs of maintaining DVR equipment. As mentioned, the purchase costs of IP equipment have fallen dramatically too. Some industries are highly regulated and require companies to retain video footage for set periods of time. Storing it on site in a DVR, as with an analogue CCTV system, can be costly and dangerous from a security perspective. Storing video data remotely via an NVR is cost effective and much safer. IP cameras capture images at a much higher resolution than traditional analogue cameras, delivering a vastly superior image quality. This is obviously hugely beneficial when examining footage of an intruder; you can zoom in and get a much clearer idea of who the person it. Better image quality also makes for fast, accurate video analytics. IP CCTV systems that utilise NVRs are proven to be every bit as reliable and durable as their analogue / DVR counterparts. What’s more they are faster too. IP CCTV is the way of the future and certainly worth investing in. However, don’t rush into a decision, especially if you have a complex analogue CCTV system already in place. Take the time to find a great security installer, who can evaluate your current setup and make a series of professional recommendations based on your business’ security requirements.